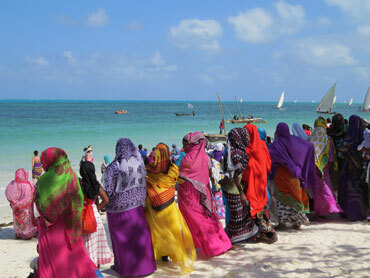 Jambiani is the place if you want to gain insight in Zanzibar’s life in combination with beach life. Lots of cozy barefoot bars and restaurants to choose from when you walk on the beach in the warm breeze. The turquoise water is stunning, and when the tide goes out the sand banks surfaces and you can swim in the clear blue “river” that arise between them. 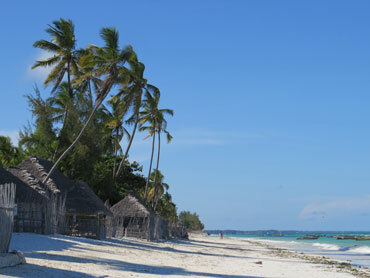 Just behind the white palm-lined amazing beach you will find a piece of the laid back, slow African lifestyle in which men and women play bao and embroiders hats in conversation. When children go to school the village is filled with colorful costumes and laughter can be heard throughout Jambiani. When you lie on your sunbed you can observe life on the shore. Cows passing, fishermen lands with their wood boats, women culture and harvest seaweed and children help their mothers find clams hidden in the sand. Jambiani is close to a variety of excursions such as swim wild dolphins, mangrove sailing, bird island, rainforest, Uzi Island, Pungume island, sunset over Chwaka Bay, The Rock Restaurant and much more. Walk in Jozani Forest the – home of 2000 Red Colobus Monkeys. The rainforest is rich in species and it’s fascinating to see all the giant plants we buy miniatures of the flower shop. The monkeys will be there and they allow you to come close- very close. Swimming with wild dolphins in the shallow waters around Kizimkazi, 15 minutes south. Visit the pristine Uzi Island- only accessible at low tide or by canoe through the mangroves. Here you travel by oxcart. Take a walk to the reef and swim from the sandbank to sandbank. Take a half day bike ride with professional cyclist Juma and discover the two authentic villages Makunduchi and Mtende and taste local specialties and fruit along the way.